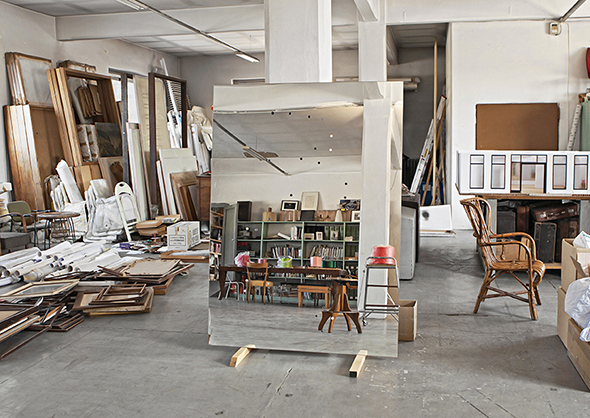 Studio Alberto Garutti, Milano, 2015. Much of Alberto Garutti’s work examines the topic of public space, reflecting the connection between the artist and the viewer, the work, and the way in which it embeds in the social context of its specific location. One example of this approach is Piccolo Museion/Little Museion (2001–03), a small, cubic pavilion made of glass and concrete situated in the suburb of Don Bosco in Bolzano. At intervals of three months, this space—which viewers can only look into—is used to display works from the collection of the Museion, the Museum of Modern and Contemporary Art in Bolzano. Piccolo Museion shows the complex interaction between artistic intervention and the urban and social context. Positioning an annex of the museum in one of the city’s suburbs triggers a process of decentralisation of the art system and generates a new, positive tension between the centre and the suburbs, between the art audience, the museum and the reality of city life and its citizens. Alberto Garutti’s work becomes a hub with a deep emotional quality. These works consist of fine nylon threads that are wound around a short piece of cardboard tube. The length of the coloured threads corresponds exactly to the distance between the two places that each work refers to and which are mentioned in the title: the distance between the artist’s house in Milan and the place where the presentation is taking place, i.e. the gallery in Berlin; the distance between the gallery and a place to which the artist has a special personal and emotional connection—for instance Bologna, where he taught. Garutti started making the Matasse in 1997, and the group is considered work “in progress.” The thread is spun out further and further, and every new piece in the group makes the network of references and connections even denser. In his Matasse works, Garutti unites the poetic understanding of space, place and distance with the empirical, with an industrial form of the object. The title includes the length of the thread, indicating not only the distance between the two places but also the emotional bond between the artist and the place or the viewer. The Matasse occupy a territorial and social context. TUTTI I PASSI CHE HO FATTO NELLA MIA VITA MI HANNO PORTATO QUI, ORA / EVERY STEP I HAVE TAKEN IN MY LIFE HAS LED ME HERE, NOW.